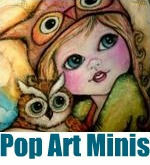 Pop Art Minis: Sweet Magical Moments and Fairy Fantastical Fun! 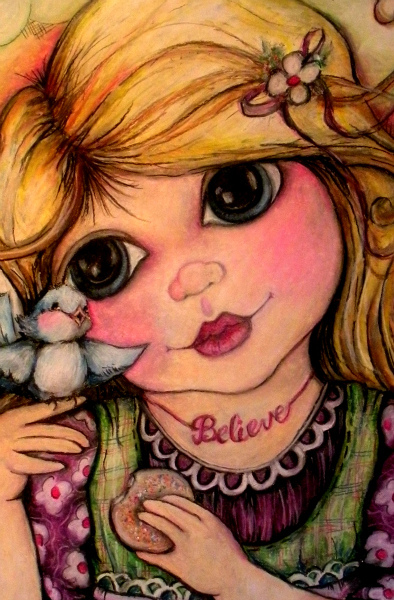 Sweet Magical Moments and Fairy Fantastical Fun! Magical moments can happen just about anytime! They're those special times when the unexpected happens making for an awesome and magical experience! 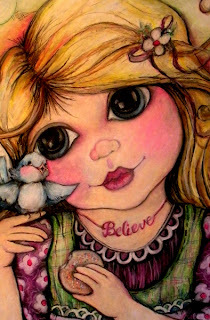 That's part of the inspiration behind my latest mini...along with just plain fairy fun! I thought it was the perfect description of when a sweet bluebird sits perched on this fairies finger as he sings a "tweet" song...a fairy magical moment indeed! Here's a peek at the up close and personals...the side by side comparison and the big reveal! Tweet! Tweet! Oh, so sweet! Believe in the power of sprinkle cookies and fairy magical moments! The after and the before...and the Big Reveal! 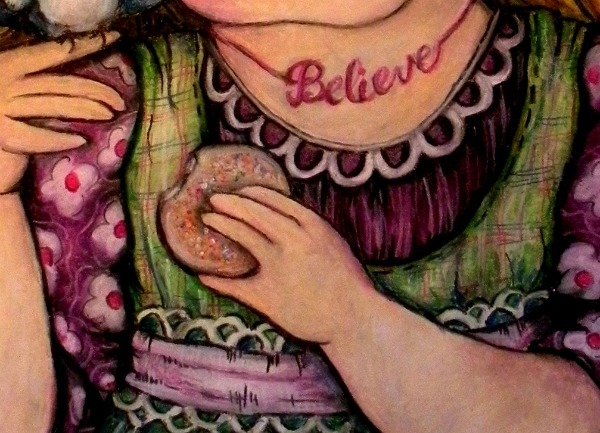 This has definitely been one of my "faves" to work on...maybe because of that connection to magical moments! I have a quote on one of the walls in my studio nest that says, "We do not remember days, we remember MOMENTS!" To me, so true...and every now and than we can add the word "magical" in front of moments...a rare and fantastical memory! One of my most special "moment memories" is the day that my Mom, (who I miss more than words can say), my Daughter Emily and I spent the day on the beach in Carlsbad, CA. 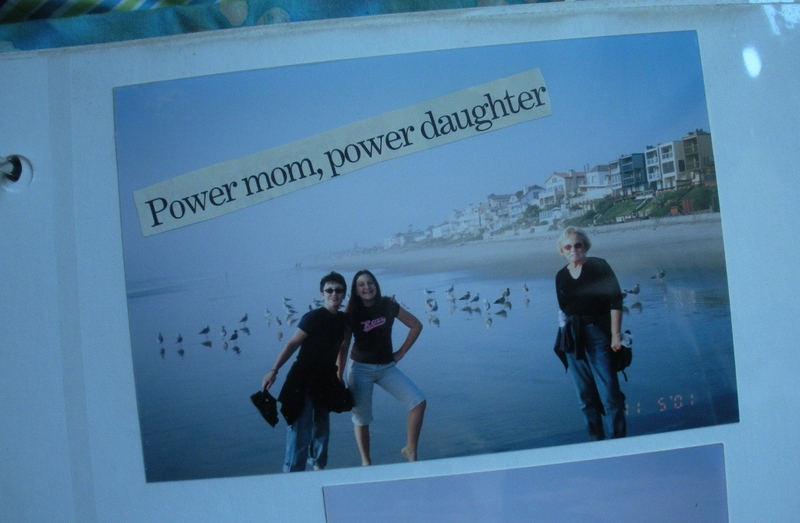 My Mom created a memory book for my daughter and a pic from that day is in the book...I took a quick snapshot of the page with the caption that my Mom used to describe that moment! I think the other power was the power of love! Definitely this is one of my magical moments as I can still feel that day...still feel the love of my Mom and the time that we shared and know that this was a magical moment! What sweet "magical moment" or "moments" do you have...that bring a smile to your face, take you to a different place and fill your world with sunshine? and also shared at "Paint Party Friday" (I'm always a day late getting there)! Always amazing art that you'll definitely want to take more than a moment checking out! 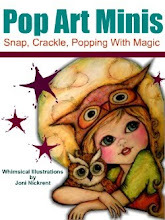 Visit my Pop Art Minis Zazzle Store for prints, cards, and more feature this design and other fantastical fun designs too! Absolutely gorgeous and enchanting...fabulous work...such spirit and beauty! Your work is always magical, this is maybe just a little more so. Love it. here's to magical moments, bluebirds and sprinkle cookies. LOVE...thanks so much for all the wonderful comments! You make my day sing! This is gorgeous. I love all the details! Magical is one of my favorite words. :) A magical moment for me was being left alone in the room after my first child was born and feeling a flood of gratitude for life. Thanks for your comment on My Blog. Saw this on the Hive - you do such beautiful work, Joni! Have a great day! Wonderful post! I love your artistic style. Very beautiful work. Been cleaning out my grandma's house for a couple months now and I walk down memory lane every Saturday we sort through things. wow, you are a talent! such detail, how beautiful. I have so many happy moments that I too treasure with my mom (whom I also miss more than words!) What a great memory to have of you, your daughter and your dear mother. 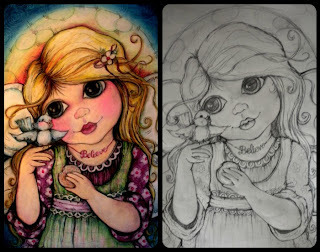 Super cute and not too twee! So cute! 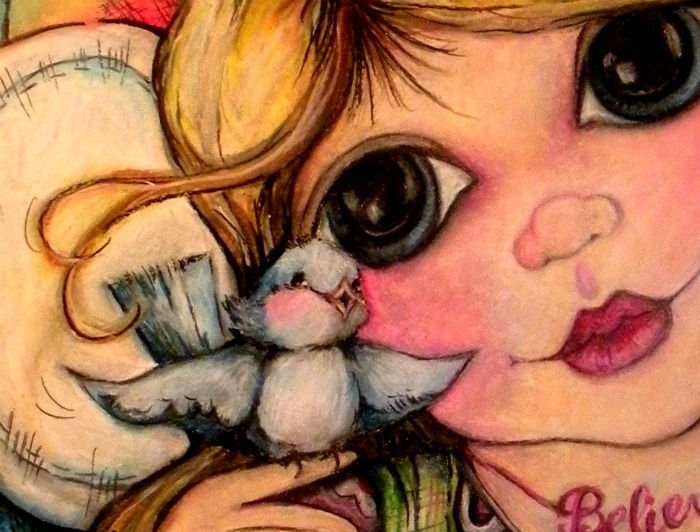 I love the connection between this sweet little bird and precious fairy girl! lovely, and we do all need more magical moments! She has such a cute face. 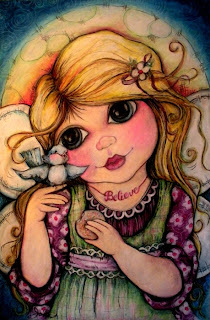 Absolutely darling image this week! LOVE it! 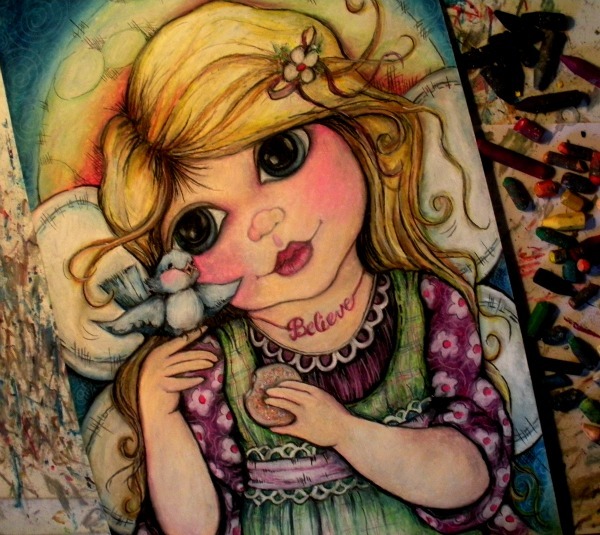 Wonderful post and beautiful painting! Definitely a time to treasure!